Nannie, can I have some Jello? Ray woke me at 6:00 because he had to go out. He did this subtly by knocking everything on the bedside table, off of it. Then he poked his way over to my knitting bag, picked it up, and shook it to within an inch of its life. I thought of the unfortunate, doomed ball of yarn zipped inside. I dragged myself out of bed and picked up his collar, palming the dogtags so that they wouldn't make noise and wake up my parents. The night before, I had removed it so that the jingling wouldn't keep me awake. I opened the door and walked out, Ray trailing. I was halfway down the hall when I heard a "click." I looked back in time to see his wagging tail disappear through the door of my parents' bedroom. I rushed back and grabbed him around the chest just as he made it to my mother's bedside. I wrangled him out of the room and shut the door quietly behind me. Unbelievably, my parents were still asleep. I put Ray's collar on him and led him outside. It was pitch black. We walked around the yard for a bit, I fed him, put on a pot of coffee, and was rustling up some breakfast when Dad entered the kitchen followed a short time later by my mom. Both managed to remain upright under the onslaught of Ray's enthusiastic 'good morning' although Ray's grab of mom's bony wrist made her cry out before I was able to drag him off of his new favorite chew toy. 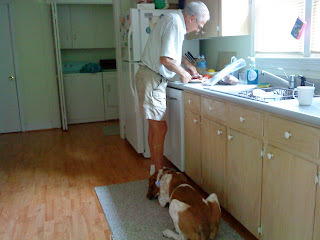 After breakfast, I took Ray for a walk around the block and then to John and Yuko's house. We were about half way there when I heard a greeting yelled in our direction. An unfamiliar man and woman were standing outside of a house, chatting, but had stopped to call to us. Ray dragged me towards them to see what they wanted. The woman, Rhonda, went to retrieve another handful of treats. "Make him sit before you give him anything," I said to Rhonda, "And then tell him to flop." Ray sat and then flopped. I was so proud. John was telling me about his 120 pound Irish Setter, Pete, the unofficial mayor of his part of town. 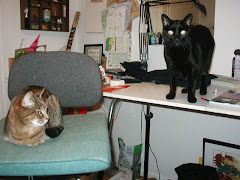 Pete wanders around cadging food and visiting "neighbors" for blocks around (including Rhonda, catty cornered from John). Everyone recognizes him and knows his name. Just as John finished telling me about Pete, a behemoth of a dog came ambling up. He was gorgeous and looked like he was moving in slow motion, his fur flowing around him like liquid fire. Pete came over for a pet. Ray tried to make friends but Pete didn't seem too interested in anything that wasn't going to fork over some food. We said our goodbyes and headed on. It was still early when we got to John and Yuko's so everyone was still in bed. I let Ray loose in the backyard and went to dig up a bone that he had buried the evening before. I had given him one when we had arrived thinking maybe a nice chew might calm him down but all he did was bury it. I gave the bone to Ray who played with it a bit, tossing it in the air and catching it (he doesn't toss it too high so rarely misses). His game finished Ray paced the edges of the yard looking for a good place to bury it again. He fell into Yuko's compost pit and instantly decided that a pre-dug hole was a great invention, dropped the bone in, and pushed dirt over it with his snout. Finished with his chore, Ray trotted over to the spot that he had buried the bone the day before (the one that I had dug out), and checked to make sure it was still safely ensconced. Disappointment was writ large on his face when he realized that his bone was gone. He sniffed around a bit to make sure that he hadn't mistook the spot then dejectedly gave up the search. I called him over, clipped on his leash, and we headed back home. 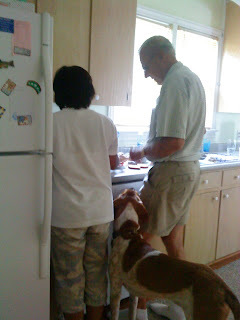 Hey Grandpa, do you need some help with that lunchmeat? Ray was thrilled to see mom and dad again. We spent the day hanging out, taking walks (to keep him out of trouble), planting plants, and helping in the kitchen. Unfortunately, the kitchen table was exactly the right height for Ray to rest his head. He used his tongue like an anteater's to flick food from the plates of the unsuspecting. 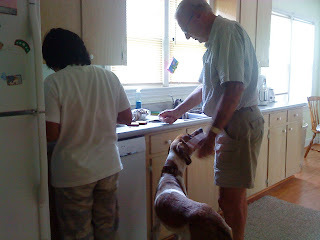 Everyone learned fast to keep their eyes riveted on their meal when the dog was in the kitchen. Are you SURE you don't need help?